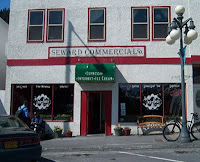 In preparing for a day trip to Seward, Alaska I did some quick research to determine what the expedition would hold. While I found some local pointers and sites online (such as to visit Exit Glacier near town), I found most of my good tips from the nice folks who ran the Hutch, a local B&B in Cooper Landing. They mentioned Ray's Waterfront for a scrumptious lunch and the quaint downtown area for some shopping. 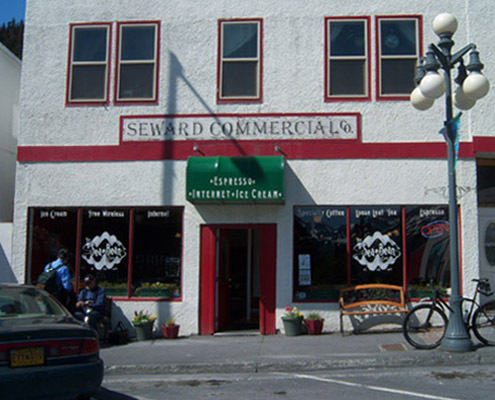 But when it came to good coffee in Seward, both the internet and locals did not give much in terms of hope. And since hidden gems seem to rarely surface, I had resolved to keep an eye out but not to get my hopes up for decent coffee. Fast forward to our arrival in town, we decided to check out some of the local shops on 4th Street. I was walking and spotted a bright green awning that said "Espresso, Internet and Ice Cream." Initially, I reasoned that I had seen this kind of advertisement all over Alaska and before I could look further into the establishment, my gut judged it as a sub-par place. Walking past it again about 20 minutes later, a few members of my party pointed it out and questioned as to why I hadn't tried the place out yet. In verbalizing my earlier pompous, book cover judgement, my party quickly descended on my shallow outlook and urged me to at least walk in and check it out. Thank God my companions challenged me. I walked into the demurely decorated coffeehouse with warm red walls, chic yet Alaskan furniture and a nice atmosphere, up to the counter where I noticed two things of great promise. 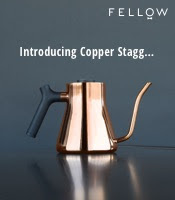 The first was a lever espresso machine; a manual means of extracting espresso usually reserved for espresso geeks. The second was the Intelligentsia Coffee logo, beaming with the substantial rays of hope that this was indeed an overlooked pearl. I engaged the barista in coffee chatter and the longer I stood there, the more positive my outlook grew. His skills in pulling my shots of Black Cat espresso seemed polished plus my cup of their house blend smelled delicious. And in a few sweet sips, it was confirmed that I cannot trust my gut to judge coffeehouses by their awnings. 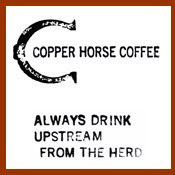 The house blend drip demonstrated notes of caramel, grass, wheat, a bit of cocoa and sage all amidst a smooth, light body; a delicious cup of what seemed like a South American-type coffee. The espresso held bright lemon, ginger, rosemary, milk chocolate, with a velvety texture amidst a brown healthy crema and a short/medium volume (a fine showing of Black Cat). The tea is Intelligentsia, Golden Moon and others. Needless to say, my compatriots did not let me live it down that I almost passed up such a wonderful specimen. If you're ever in the area of Seward, don't make the blunder I almost made. Go to the Sea Bean. That's a phenomenal description of a cup of coffee and you made it sound delicious. How can you tell the difference between South-American coffees and other coffees by taste? Good question. Coffee is a lot like wine in that its beans depend on a lot of factors (genetics, terroir, environment, etc) so rarely do coffees taste identical. But regions, largely due to similarities in genetics and environment, tend to have similar characteristics. South American coffees do typically have specific flavors (bits of honey and wheat).